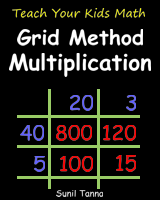 The grid method (also known as the box method) is the way that most children today learn to multiply large numbers (do "long multiplication"). The grid method can seem baffling to parents who learnt traditional long multiplication - but this step-by-step guide solves that problem! The book contains step-by-step instructions, numerous colorful examples, and over 100 questions and answers (including show you how to get the answer). This book, Teach Your Kids Math: Grid Method Multiplication, will help you and your children master the grid method in next to no time!